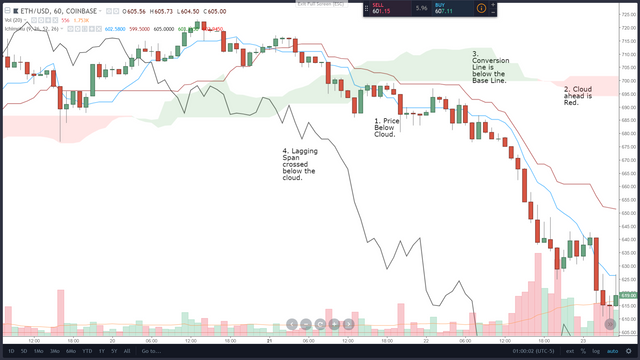 An Honest Trading Guide and Strategy: The Ichimoku System - Learning this helped me attain profitability.steemCreated with Sketch. Without prefacing to much with an anecdote about my struggles to attain profitability, I will say that I suffered. My journey to profitability was difficult. It was hard on me, hard on my wife and family. I was quite literally on my knees praying to get out of the hole I had selfishly and stupidly put myself in. I became desperate and tried every stupid trade system I saw, I tried every single fake signal site and auto-trading email signal service that I could find. After a time of feeling like a failure and experiencing the crushing feelings of shame, I still trudged on with trading and trying to make a go of it. The very first thing that really helped me was the Ichimoku System. As a full-time trader, writer and educator (I'll link at the end of this guide where you can find me, shameless plug) I am very, very passionate about quality education in the trading world. There is so much crap, so many lies, so many false hopes sold to people that I want to help guide people to honest and true information. And I think the first and the best thing that I could teach is something that helped me. And it has helped many past and present clients as well. For the purposes of this guide, we will be using the Western/Murican names for the components of the Ichimoku System, I put the Japanese names in parenthesis (just one time though) because it is important to know. Ichimoku Kinko Hyo is the full name given to this system. Roughly translated, it means: "Equilibrium at a glance" or just "the market at a glance." What I have always found peculiar is that most trading software has the Ichimoku System listed as an indicator when, in fact, it is a separate trading system. It is available for free on almost every piece of trading software. It is a system that gives us a very clear picture of what is happening, what has happened and how the current price action relates to past traded value areas. It's a phenomenal and time-tested system that has been in use since it's creation in Japan before World War II. If you are familiar with Moving Averages, then these two lines may look familiar. I actually often refer to the Conversion Line as the fast average and the Base Line as the slow average. They are not like normal moving averages. Most moving averages are based off the close of the candlesticks. The Conversion and Base lines in the Ichimoku System take the midpoint of the high and low instead of the close. The Conversion Line should be treated as a good area to enter on pullbacks to that line. The indication of a strong and powerful trend is when price consistently stays above the Conversion Line in a bull move, or below the Conversion Lines in a bear move. The Base Line also acts as a support level. When we begin to see the Conversion and Base lines no longer acting as support or resistance, then we have an early warning sign that the trend may be ending. This component is what the Ichimoku System is most famous for: this colored blob on a chart. All the Cloud is, is the position of the Conversion Line and Base Line but moved forward 52-periods. The color area represents the space between the Conversion Line and the Base Line. If the Conversion Line is greater than the Base Line, then the cloud is colored green. If the Conversion Line is below the Base Line, it's colored red. If we move most of the 'noise' on the chart and leave just the Conversion and Base Lines with the Cloud, it provides a great visual explanation. The great thing about the cloud is that when price is trading inside of it, we're in a 'squeeze'. If you're familiar with Bollinger Bands, then you know about the Bollinger Squeeze/Consdoliation. 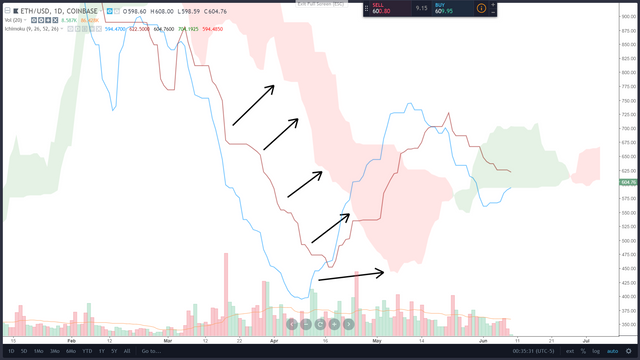 The Ichimoku System shows us the same thing as a Bollinger Squeeze when price is trading inside the Cloud. 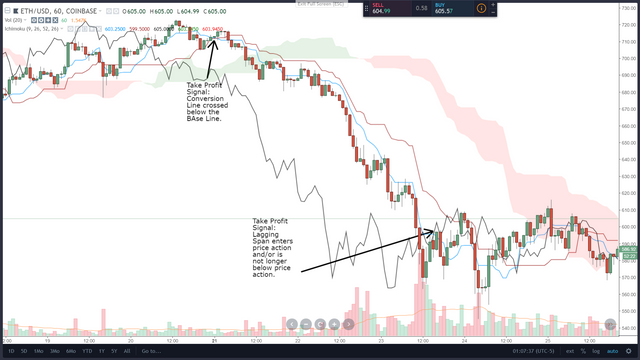 I do want to note that I purposefully omitted two components in the Ichimoku System and those are hte names of Leading Span (Senkou) A and B - which are just the Conversion Lines and Base Lines moved forward forming the cloud. I've found that for me and for past clients/students, its easier to just call the Cloud the Cloud. No need for extra stuff! This is probably the most misunderstood and ignored component of the Ichimoku System. 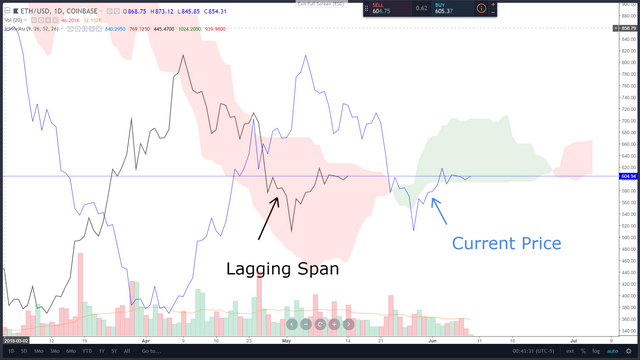 There are many Ichimoku guides out there that omit the Lagging Span totally. Which is a huge error. 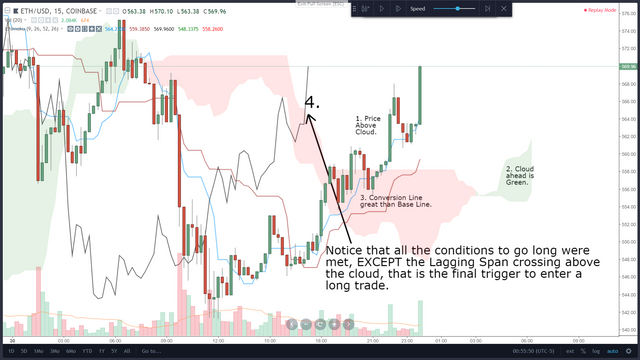 It's a huge error because the Lagging Span is a trigger for many entries and exits and a very powerful confirmation tool in the whole system. This will make more sense when we go through the basic entry rules. Anyway, the Lagging Span is the current price action moved back 26 periods. Another visual here helps, especially if we change from a candlestick chart to a Line Chart. Now that we've got the components, here's the meat and potatoes on how to trade this system. Price must be above the Cloud. The Cloud ahead must be Green. The Conversion Line must be greater than the Base Line. The Lagging Span must cross above the cloud and be above the candlesticks. Price must be below the Cloud. The Cloud ahead must be Red. The Conversion Line must be lower than the Base Line. The Lagging Span must cross below the cloud and be below the candlesticks. Almost every single time, the Lagging Span is going to be the final 'trigger' needed to enter a long or short. Again, the Lagging Span is the secret weapon in this system that is to often ignored. It keeps you from taking a trade to early or from taking a trade that shouldn't happen. When do I take profit? When to take profit something of a contentious issue with a great many student and analyst. 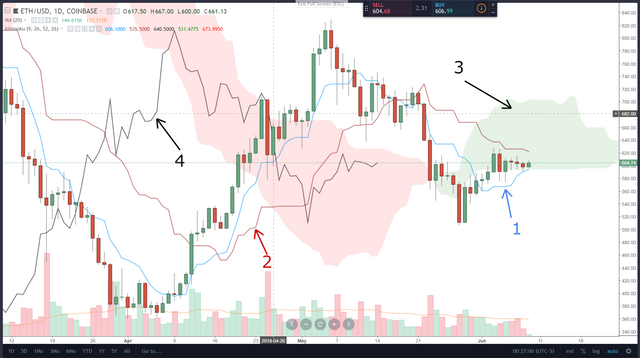 With the Ichimoku system, there are a few things that would signal we want to take profit. Sell when the Conversion Line crosses beow the Base Line. Close Short/Cover when the Conversion Line crosses above the Base Line. When the Lagging Span enters the candlesticks - in other words, if the Lagging SPan is no longer above price during a bull move or is not longer below price in a bear move. I hope you found this information helpful and useful and I would greatly appreciate any feedback, especially if there is something you would like me to clarify! Thank you for reading and have a great day of trading! Nice simple guilde, Thank You. Everyone I know who is an early adopter of crypto currency will say that you have gone bonkers. There is no room for technical analysis in the same respect that it had no power to determine price or volatility of stocks during the DOT COM Boom & Bust. This is a bubble of speculators just like yourself. And you should prepare for more of that kneeling & praying because the slaughter has just begun. Better yet, throw everything into Stellar (XLM) and just go to the beach. You may not want to witness this wave... On the other hand, you could join me and I can help to make sure you are never the one on your knees again. Take back your power and become the Master!